Chapel Hill and Carrboro high school students attend school just down the road from a major university — nevertheless, the transition to a foreign and overwhelming college atmosphere after graduation often catches them off guard. But a trio of UNC students has jumpstarted a program to assist local high school students, particularly those without strong college backgrounds, with the shift to college. The initiative, called Launch, began last year as the brainchild of sophomores Frank Wu and Manhas Narra, who are business majors and close friends. Fellow sophomore and Chapel Hill resident Abby Dennison joined the team shortly after, and her experience as a student at Carrboro High School provided much of the inspiration for Launch. “At Carrboro, I was lucky enough to have a lot of support and mentorship from older students — figuring out what I was doing and what classes to take, for example,” Dennison said. But she said she noticed a lot of struggling students who weren’t so lucky. “Those experiences I had informally, I want to be a system for kids to have formally,” she said. Wu, originally from California, works in UNC’s Office of Undergraduate Admissions, and he said he’s had conversations with co-workers about college dropout rates for first-generation college students and underrepresented minorities. “There are already some mentorship programs to help people get into college, but I feel like there’s a lot less focus on retention,” Wu said. Wu and Narra started developing Launch last summer — shortly after, Launch began receiving funding and instructional support as part of a Robert E. Bryan Social Innovation Fellowship grant from the Carolina Center for Public Service. Narra said Launch’s approach centers around sending successful college students into high school classrooms to assist their younger peers in the application and transition process. “The students are part role model and part instructor,” he said. When the program officially kicks off in the fall, each Launch volunteer will be assigned five or six students. The volunteer will lead the students in a workshop every other week covering some aspect of college — whether it be financial aid, finding a roommate or choosing freshman courses. Launch won’t only be instruction-focused, Dennison noted. She wants to see volunteers keeping in touch with their group between lessons and spending time with the students outside the classroom. “There are really basic things they can do to help kids stay on track,” she said. At first, the new initiative will work in tandem with the Achievement Via Individual Determination, or AVID, program that is already in place in Chapel Hill-Carrboro City Schools. AVID singles out students in middle school who don’t have a strong college background. Launch wants to target that group and give them extra individual attention, Dennison said. Over the last couple of months Launch has begun a pilot program in schools such as Carrboro High School and East Chapel Hill High School. Carrboro math teacher Mary Rogers, who leads one of the school’s AVID groups, observed Dennison and Wu giving a Launch presentation about financial aid in her AVID class a few weeks ago. The workshop taught students how the process works and what the different parts of the award letter mean, a topic Rogers said she covers in AVID — but the college student perspective was more engaging for her class, she said. “Hearing it from students who just went through the process in college was much more meaningful to my students,” she said. Rogers added that there is definitely a need for an initiative like Launch — she said she can see Launch working alongside AVID at Carrboro and in other local schools. “I’m excited about the program, and I hope they can come back soon,” she said. Wu said the Launch team will focus on four high schools in Orange and Chatham counties in the fall, although a long-term goal is to reach out to rural counties in the state that don’t benefit from the proximity of a university. “We want to take inspiration from schools like Carrboro, figure out what services they’re providing and try to replicate them for students who don’t have access to them,” Dennison added. Dennison is no stranger to the education scene — both of her parents are teachers, and she is an experienced tutor with an eye toward teaching as a career. 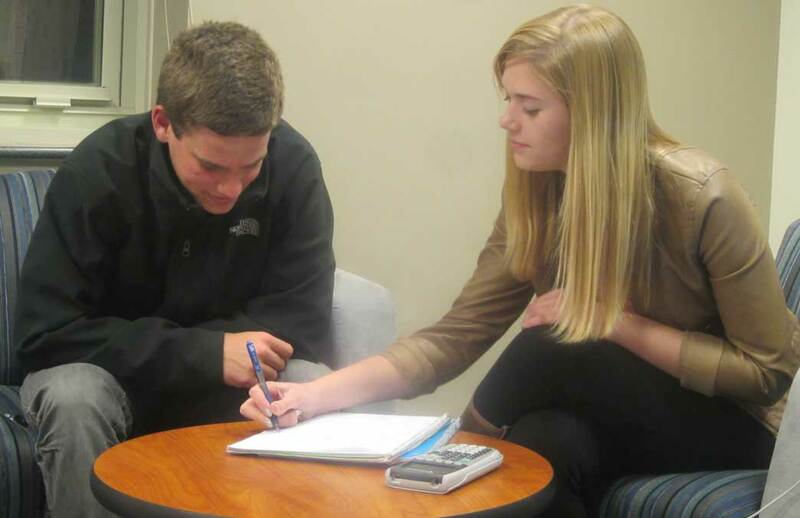 Last fall, Dennison co-founded Tar Heel Tutors, which employs around 15 UNC students as tutors for Carrboro High School students. “I grew up with this dinner table discussion of, ‘Hey, what are we going to do about the achievement gap? What are we going to do about income disparity as it pertains to taxes and school systems?’” Dennison said. That background fueled Dennison’s passion for improving and spreading education — something she, Wu and Narra all feel strongly about. Wu, who plans to pursue a career in education administration, agreed with Dennison about the impact education has had on him, both from a general and personal perspective. “From what I can see, education is what broadens people’s perspectives and makes them happy and productive citizens,” Dennison added. Launch is not a household name on UNC’s campus yet — but Dennison, Wu and Narra have gotten plenty of positive feedback about the initiative. “I’ve talked to (UNC) students who are first generation and came from schools that didn’t have that kind of support, and a lot of them are really excited about this idea,” Dennison said. The idea behind Launch is relatively simple, Wu noted. He doesn’t see it as revolutionary or innovative, but as employing creative solutions to a fundamental problem, he said.